The Global Volcanism Program has no activity reports for Bur ni Telong. The Global Volcanism Program has no Weekly Reports available for Bur ni Telong. The Global Volcanism Program has no Bulletin Reports available for Bur ni Telong. The conical Bur ni Telong volcano was constructed at the southern base of the massive Bur ni Geureudong volcanic complex, one of the largest in northern Sumatra. The historically active volcano lies 4.5 km from the summit of Geureudong,and its summit crater has migrated to the ESE, leaving arcuate crater rims. Lava flows are exposed on the southern flank. Explosive eruptions were recorded during the 19th and 20th centuries. Cameron N R, Bennett J D, Bridge D M, Clarke M C G, Djunuddin A, Ghazali S A, Harahap H, Jeffery D H, Kartawa W, Keats W, Ngabito H, Rock N M S, Thompson S J, 1983. Geologic map of the Takengon quadrangle, Sumatra. Geol Res Devel Centre Indonesia, 1:250,000 scale map and 26 p text. There is no Deformation History data available for Bur ni Telong. There is no Emissions History data available for Bur ni Telong. 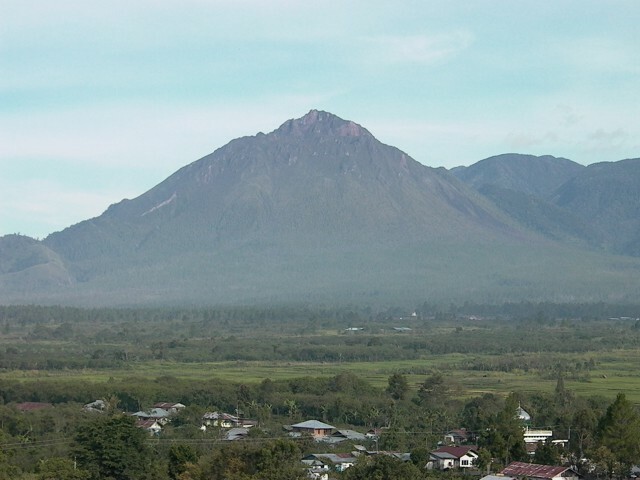 Historically active Bur ni Telong volcano, seen here from the SE, was constructed on the southern flank of Bur ni Geureudong volcano, part of which is visible in the background. The two summits of the complex are 4.5 km apart and differ only 34 m in elevation. The summit crater of 2624-m-high Bur ni Telong has migrated to the ESE, leaving arcuate crater rims. Lava flows are exposed on the southern flank. Explosive eruptions were recorded during the 19th and 20th centuries. There are no samples for Bur ni Telong in the Smithsonian's NMNH Department of Mineral Sciences Rock and Ore collection. Large Eruptions of Bur ni Telong Information about large Quaternary eruptions (VEI >= 4) is cataloged in the Large Magnitude Explosive Volcanic Eruptions (LaMEVE) database of the Volcano Global Risk Identification and Analysis Project (VOGRIPA).